Up until a few years ago, I only made it one way: Julia Child’s. I still think her onion-caramelizing technique is great. It saves a little hands-on time, basically a miracle when it comes to caramelizing onions, although nothing is going to make it go quickly. That’s how I cooked when I began this site: the way I was told to. But through repetition and real life, I’ve made adjustments. 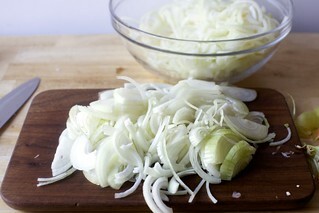 For example, I always felt that the soup needed more onions, more bulk, for the amount of stock. 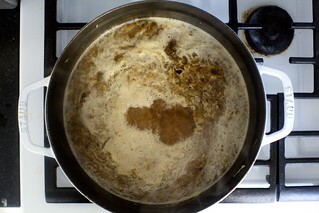 I never found that the flour added any notable body to the soup the way it should; it didn’t really stay suspended. And when I added booze, it was sometimes wine or vermouth but just as often a dry sherry or even cognac, and I’d deglaze the pan with it and cook it off as much as possible. When I began with more onions, I didn’t need to cook the soup as long after the stock was added (15 to 20 minutes is plenty) to end up with a soup with good body. And I finish it with as little frippery as possible. Don’t have ovenproof bowls? Make a casserole of it, like a giant pot pie. 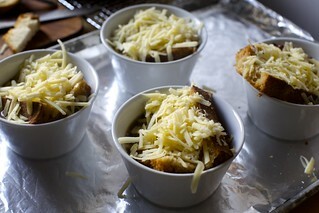 Or, create individual cheese toasts and drop them onto the soup. Want it vegetarian? Use a good dark vegetable stock, or mushroom broth, which is a favorite here; the more robust, the better. Cannot possibly imagine spending an hour or longer frequently attending to caramelizing onions? Check out The Food Lab’s approaches (pressure cooker or other) to speeding it up. Want less hands-on time? Check out The Kitchn’s slow-cooker approach. Hate slicing onions? Sigh, that, for me, is the part I dislike the most. For this, I recommend putting on some music, donning your pink onion goggles, and enjoy knowing that once you get this done, the remainder of the recipe is virtually hands-off. Because this is rich, I use 12-ounce (or 1.5-cup) ramekins/baking dishes (from BIA Cordon Bleu I cannot find online but here’s something kind of close. Some people prefer it in more of a 16-ounce or 2-cup bowl, in which case, you might only get 6 servings. Tip: I always start with an onion or two more than I need, because due to the vagaries of buying onions from grocery stores in the middle of winter, I never know when I’ll get one kind of banged up inside, except reliably any time I don’t buy extras. 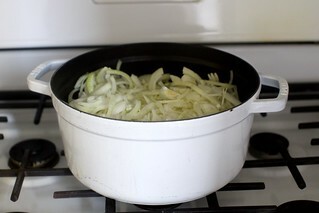 Caramelize your onions: Melt butter in the bottom of a 5- to 6-quart saucepan or Dutch oven over medium heat. Add the onions, toss to coat them in butter and cover the pot. Reduce the heat to medium-low and let them slowly steep for 15 minutes. They don’t need your attention. Uncover the pot, raise the heat slightly and stir in salt — I start with between 1 and 2 teaspoons of fine sea salt, or twice as much kosher salt. Cook onions, stirring every 5 minutes (you might be fine checking in less often in the beginning, until the point when the water in the onions has cooked off) for about 40 to 90 minutes longer. 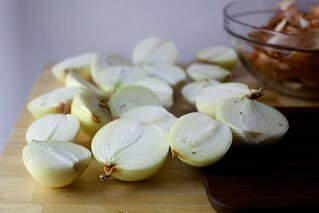 Make the soup: Onions are caramelized when they’re an even, deep golden brown, sweet and tender. 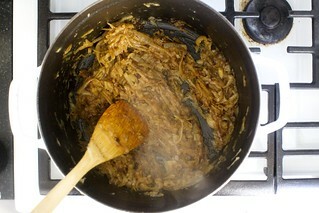 Add sherry or vermouth, if using, and scrape up any onions stuck to pan. Cook until it disappears. Add stock, herbs (if using), and a lot of freshly ground black pepper and bring soup to a simmer. Partially cover pot and simmer for 15 to 20 minutes. Taste and adjust seasoning as needed; discard thyme sprigs and bay leaf if you used them. While soup is finishing, heat your broiler, and if you don’t have a broiler, heat your oven as hot as it goes. If your bread is not already stale (i.e. 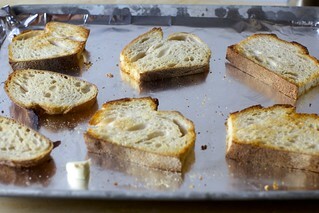 you did not leave the slices out last night to harden, probably because nobody told you to), toast them lightly, until firm. Rub lightly with a raw garlic clove. Line a baking sheet with foil and arrange soup bowls/vessels on top. To finish: Ladle soup into bowls. Fit a piece of toast (trimming if needed) onto each. Sprinkle with cheese. Run under broiler until cheese is melted and brown at edges. Garnish with herbs. You can eat it right away but it’s going to stay hot for a good 10 minutes or so, if you need more time. I love french onion soup. I think caramelized onions are one of those mystical ingredients that people are afraid of attempting. Thank you for this! I crave it with mushrooms. It is a widespread belief and I guess it is legit as well that eating onion creates a smell in the mouth or bad breath per se. Would such breath be a result of consuming such an amazing soup? How do you find these work as leftovers? 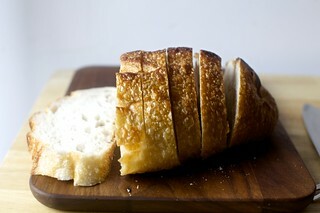 Or, would you do the final portioning and bread-layering steps differently if you were anticipating leftovers? I would love to try this recipe but don’t see myself cooking for 6-8 people in the near future! When I make this I finish them with the bread and melting cheese in the oven. Extras I slip a ziplock freezer bag over and pop them in the freezer. They microwave nicely for my husband’s lunches. I buy costco bags of onions and cut the whole 10-12 lbs with a mandoline, then make the onions mostly according to this recipe, using a whole bottle of white wine bought for this purpose. Then I seperately (usally on another day) make beef stock in my Instant pot using a mix of shanks and oxtails as well as a few aromatics. I freeze family-dinner-sized portions of both onions and broth–usually can get about 5 out of each batch. Whenever we have random ends/pieces of bread leftover, I toast the leftovers, cool, and then put in a bag in the freezer with other previous leftovers. For simple weeknight dinners, the night beforehand I take out one bag of frozen onions and one bag of frozen broth and place in a casserole dish in the fridge. The evening of, I turn on the oven to 350, then slice or grate a mix of swiss-type cheeses and/or parmesan, then pull out the casserole dish, dump the 75% unfrozen ingredients in, add a glug of brandy, then stir to break up any ice. I top with the frozen toasts and then the cheese then put in the oven. In about 30 min the soup is bubbling, then I turn on the broiler for 3-5 min to finish toasting the cheese. Usually serve with a salad or sliced raw veggies. It maybe sounds like a lot of work, but basically it is 2 occasional weekend projects I can supervise while doing other chores/kitchen tasks, then a dinner that is quick to assemble and not terribly long to get on the table as long as I plan 24hrs in advance. 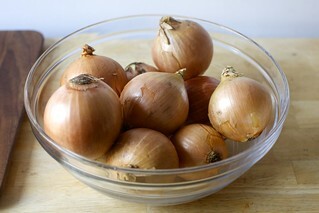 No – cartelizing or long cooking of onions removes those nasty fumes – onions will be sweet with no onion breath worries. Hi! I’ve been thinking about French onion soup so this is good timing. I’m also in the market for soup bowls, and I’m curious- what are the ones in the photo? They look like they might work for me. Thank you!!!! PS. a great tip I learned a long time ago is if you are making vegetarian French onion soup, add miso to the vegetable broth to add depth and umami. Check the headnotes, where I link to an alternative. Instead of goggles, I’ve started using a countertop fan next to my cutting board. I chop nearly tear-free. oops never mind- I see the note now about the cups! Cutting the onions in the food processor with the slicing blade changed my caramelized onion life forever. I make them all the time now and the best part is that they cook evenly because everything is the same thickness. Hi Deb, what stock do you use for this, if you use store-bought? Looks delish! I used storebought beef but when I have time to go the extra mile, I really love it homemade. I just didn’t have time this week. I owe you guys a roasted beef stock recipe — I made it and photographed it and then it fell into a content abyss! Yes, please!! I want to make beef stock before the weather gets too warm. Martha Stewart has a very good, but labor intensive recipe in her Cooking School book. While chopping onions, if anybody in the house has a pair of swimming googles, a snorkling mask, a skiing visor, or a motorcycle helmet, those make excellent eye protection too. Anything with a moderate seal, it doesn’t need to be perfect. Even “I just went to the eye doctor” sunglasses are better than nothing. I don’t like using my woodworking googles, they have too much ventilation to stop the fumes. Good point. The onion goggles I link to are fine but not amazing. Also, contact lenses! I only seem to have a problem with weeping eyes on the days when i’m wearing my spectacles. If i’ve got my contacts in, i can cut a whole pile of onions with dry eyes! Yes! Years ago, when I got Lasik, the only bad thing was my eyes were much more sensitive since I no longer had contacts to protect them. Slicing onions went from no big deal to torture. I have the pink onion goggles, too, and they help but not entirely. A vegetarian onion soup! So excited to try this! I’m especially interested in knowing what brand (if store-bought) of mushroom stock you prefer–thanks! I don’t have a preference but I did see a box from Pacific at the grocery store this week, which gave me hope they’re getting more popular/common. Better Than Bullion makes a mushroom base that is crazy amazing (mushroom loving vegetarian here), not easy to find in stores but worth ordering online- the little jar makes a ton. Very useful for sauces and mushroomy gravy as well as soups. My grocery store carries this brand! I’ve used their vegetable base but not the mushroom base, but it looks like I’ll be rectifying that soon. Thanks for the recommendation! A Korean friend of mine taught me to make KimChee Chi Gae using mushroom broth. She just poured boiling water over dried mushrooms, I think they are shitakes, from the asian store. Let it sit just barely covered until it smells strong and delicious. Strain off the stock and cook up the reconstituted mushrooms in other recipes. Old school traditional Korean food uses lots of dried vegetables including dried chard. I whish she still lived near me. …but I don’t like onions. I’m curious if there is ever hope for a cheesy, meaty, umami-rich soup for someone like me? Maybe make a mushroom soup? Or mushroom farro or barley (this one is very flavorful)? And put the cheese and bread on top. I don’t love onions, but I love onion soup. I either chop the onions into a smaller dice which bothers me less (less stringy and slimy), or else just eat the broth and croutons, and leave a pile of onions in the bottom of the bowl. Because the onions are so caramelized the soup doesn’t taste like raw onions anymore. Have you considered ramen? A rich Tonkatsu broth meets most of your requirements. I don’t think the bowls you linked are broiler safe. Could you recommend some bowls that are broiler safe? I would love to make this soup! Thank you! Several people in the reviews for the bowls Deb linked indicate that they are broiler safe. Where are you seeing otherwise? I don’t trust reviews. Only the product description which, in this case, says they are microwavable. I’m not looking to microwave French onion soup. I just use my regular Fiesta bowls and they work fine! Why 1/2 as much kosher salt? I thought you would use twice as much! I am wondering the same thing! I always thought sea was more saline than Kosher? It’s a mistake; now fixed! i was thinking of making french onion soup this week or next, so this is very prescient. i usually use the julia child recipe as well, but just leave out anything that feels too fussy to me that day. i’ll be trying your version next. i have found, however, that using half beef stock/half water makes a more onion-y soup, plus it has less sodium. you do have to make sure that onions are very well carmelized, though. Love onion soup and feel ready for an update. I think I haven’t cooked my onions long enough in the past. Might try the pressure cooker method. There is a bakery in New Orleans where the guy grinds his own wheat on a stone mill. It is heaven and demands to be atop FOS… you featuring this today is kismet and I will be making it tout suite! No doubt it will become another SK staple in my kitchen. Thanks for being you! I had forgotten how much I love this recipe. Thank you! This might be a weekend project. I slice my onions on a V slicer ..mandolin.. so nice and even. But to avoid tears, I place peeled onions in freezer for 5 minutes..taking out 2 at a time as needed. Seems to work. I think it’s because the onion juice is partially frozen. Can anyone verify this? This was the best dinner we’ve had in ages; my brother was complaining that I never go through the 5 lb bags of onions he hauls home from the store every other week and I found 4 boxes of beef stock in the pantry that expire in May, (I make chicken stock every week with the carcasses of the two rotisserie chickens my brother devours as “work snacks”, so I’m always finding vegetable/beef stock tucked away in corners). I used the time watching the onions to clean out the rest of the fridge and pantry- it’s honestly the best motivation to get random kitchen chores done when you have to be at the stove anyway! The soup came out so delicious- I actually used half a bottle of stout left in the fridge to deglaze the pot and we loved the end result. Also (because my brother insists it’s not a soup if it doesn’t have noodles) I broke up some angel hair pasta into 2-inchish pieces and tossed them in at the end. And since I found some stalks of celery in the crisper (as I cleaned it out while the onions cooked), I sliced them into 1/4 inch pieces on the mandoline and added them for the last 15 minutes of caramelization. The end result was the warmest, cheesiest, most decadent-feeling dinner that was, as my brother put it, “the best thing to come home to after a long day bartending” and the first meal with no real meat in it I’ve seen him devour since I made him your mushroom marsala! Thanks for the fabulous update; I love the theme of revisiting classics! Here’s another shout-out for Mushroom Marsala, one of the best recipes from this site, IMHO. Even my carnivores request it! I’ve seen a lot of recipes with various types of onions. Is there a particular reason why you only use yellow onions and have you tried with a variety before? It’s my favorite for caramelizing; it has the most flavor. Can you please explain a little why you wait to add the salt? I thought adding salt at different stages helps develop flavor. Is there something going on with the chemistry of initially cooking onions that entails waiting to add salt? Thank you. I can’t speak to the food science of it, but in this case, I find it better to give them a little steeping time (it will be plenty wet) before drawing more moisture out of it. I think you would suffer less during onion slicing if you cut off the stem end first – then the other end; then remove the ‘skin’ – then cut in half horizontally and do the rest of the slicing. The reason is that the fumes and odor are concentrated in the stem end of the onion – so getting that away from cutting board asap is helpful. In the past, your “Print” button has been one of the most reliable of the many sites that I use. Recently, when I want to print a recipe of yours the long list of links of “previous” recipe is included. A waste of ink and paper. It should be fixed now; I forgot to put in the page print markers when I published yesterday. Can you tell me which other recipe gave you trouble? It can be fixed. Sounds so richly delicious! We double up on the grated Gruyere and place a modest heap of it onto the bottom of each bowl, add the onion soup, then the garlic-rubbed bread with more Gruyere on top of that—> then under the broiler. Hearty heaven in a bowl! Love your recipes but I wish I could print or save the recipe only and not all the other info. Is there anyway that can be done? The print template should be working now. There is a print icon that leads to a print template at the bottom of each recipe, where it says “DO MORE:” You can also click CTRL + P from any recipe post and it will take you to a streamlined print template. Do you ever make your own beef stock? It’s a lot of work and a big greasy mess, but the results are amazing. Not specifically about this recipe, but a general question about putting a bay leaf in almost anything: Is there any reason not to use a small amount of ground bay leaf, and not have to worry about fishing the bay leaf (leaves) out? I haven’t used ground bay leaf before, but I don’t see why not. Yum. One of my favorite recipes. The new streamlined version is really similar to my “home cook” (i.e., hungry toddler, tired mama, limited pantry list) version I adapted from an old southern living recipe for bistro onion soup – will have to try your version and make it actually follow a recipe. Slicing is my least favorite part; I find the mandolin does a more even job than the food processor and is still a decent timesaver. I always make double and freeze the second batch in quart size baggies in the fridge (perfect for 2 people and a toddler), and I slice and freeze french bread and keep in the freezer so that it’s always a freezer meal option – just top frozen bread with butter and cheese and toast in a 400 degree oven (then put on top soup – also how I solve for the hot bowl issue). The best french onion soup I ever had was at the top of one of the mountains skiing at Whistler probably 10ish years ago in some tiny little slopeside restaurant. I asked what their secret was (sure they wouldn’t tell me) and was told they use half red onions and half yellow onions. In real life, I use whatever onions I have on hand, but when I can I try to use a mix and I think (imagine?) it always tastes better that way. One of my favourite things about living in Europe (N. American transplant), is that Picard and other grocery stores sell huge bags of pre-chopped onions without shame. Was thrilled when you posted this and couldn’t wait to try it out. It was PERFECT. I halved the recipe which worked out well. I also don’t have ovenproof bowls so I broiled the gruyere toasts in my toaster oven and just put them on top of the soup when they were ready. French onion was my mom’s favorite so this brought back great memories. Thanks for posting! Definitely going to make this – but just wanted to also chime in and note that your observation about how the way you cook and shared recipes on this site has changed over the years is very on point. I’ve been reading this blog since I was in middle school – I’m now in my mid (okay, late) twenties and one of those young millennial professional people. I read this blog through high school, university and several international relocations. Just as the way I’ve cooked and eaten has undergone several changes over that time, It’s been really great watching you do the same. I especially love the move away from closely following recipes by ‘the greats’ to doing your own thing through a lot of practice and cooking intuition. Again, the way I cook has mirrored a similar pattern and I believe the SK has most likely had a huge impact on the way I cook today. To growth! I made this the other night and it was amazing. I cheated and cut the onions into quarters and threw them into the food processor with a slicing blade. A few quick pulses cut the onions enough, and I wasn’t crying in my kitchen for an hour. I used half beef/half chicken stock and it was delicious. I thought the thyme gave it a nice taste. Definitely a keeper. These instructions are amazing! I tried a Martha Stewart recipe for my first try at French onion soup about 20 years ago and was flummoxed from the get go. Turned out fine, but it was so stressful to be guessing when you’re cooking for guests! And great point about extra onions…you just never know what’s on the insude with onions or apples! Such good comfort food for (hopefully) the last snowy day in April! I made this Saturday, and my husband and I had a bowl for dinner – delish! Took the remainder of the pot to a family dinner yesterday and everyone loved it. I did add a bit of Worcestershire sauce and a tablespoon of balsamic vinegar. So good! Thanks, as always, Deb! This was fantastic!! Well worth the labor of chopping 3lbs of onions. I found the soup need a tiny bit more acidity for my taste, so I added about 2 tbs of sherry vinegar with the broth. Can’t wait to eat this again. Thank you, Deb! I forgot to mention this but something I saw in J. Kenji Lopez-Alt’s version was 1 tablespoon of fish sauce for an umami boost. You might like that here too! Just want to write in to say this is fantastic!!! Annnd if you are tempted not to make it because of milk allergies or gluten, still make it. I used avocado oil instead of butter (it has a high-fat content and no weird taste) and just left out cheese and bread. I did use beef bone broth to keep it rich without the butter. Shockingly it feels decadent and not at all like an allergy alternative. Deb knows her stuff. I made the vegetarian version of your soup. Even though I faithfully stirred every five minutes, after the first fifteen minutes, after 90 minutes, the bottom of my stock pot was burnt black. I had to switch pans. It was good, but seemed like something was missing. I added a big tablespoon of Better than Bouillion vegetable flavor. That made this soup perfect! When I slice mine with a mandoline, I don’t suffer from crying. It also makes all the hassle much faster. So I highly recommend that if you own one. Deb – I always follow your blog and just had to say thanks for the honest recipe with its link to the article about the baffling lies out there about onion caramelization cooking times! I have always wondered the same thing as the author – is there a conspiracy among recipe writers to lie so brazenly about it ?!? (That and the length of time it takes to cook diced or sliced potatoes stovetop – “dice potatoes into 1/2 inch pieces and fry until fully cooked, 8-10 min”. NO!) Your recipes are usually spot on which keeps me from giving up in the kitchen when I know what to expect. First, thank you. Second, I think that the article I linked to presumes that recipe writers aspire to lie about it, but I think it’s less nefarious. I think that you can sauté onions until they get soft and pick up (uneven) color in 10 or so minutes, it’s just not what French-taught cooks call caramelization, which is much lower and slower and leads to a deeper flavor. for this many onions slicing on a food processor is a must. job’s done in like, two seconds. My son came up with his own version of French onion soup while in culinary school. Yes, it is a ton of onions and caramelization for flavor but he always like to add the sherry at the end too! Made this for lunch today, it definitely took a long time to caramelize the onions but worth the wait. I used Madeira to deglaze as it was all I had! I did feel like maybe it needed an extra hit of umami so I will probably try to fish sauce add in next time. I will be making a larger batch to freeze very shortly! I made this exactly as written and it was wonderful. We put leftover soup in the microwave then added the bread and cheese and put it under the broiler in the toaster oven and it was perfect for lunch the next day. Thanks, Deb! 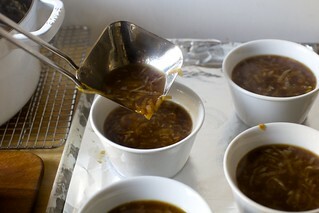 French Onion Soup is a hungerpass.com/ favorite! Such a classic & flavorful dish! 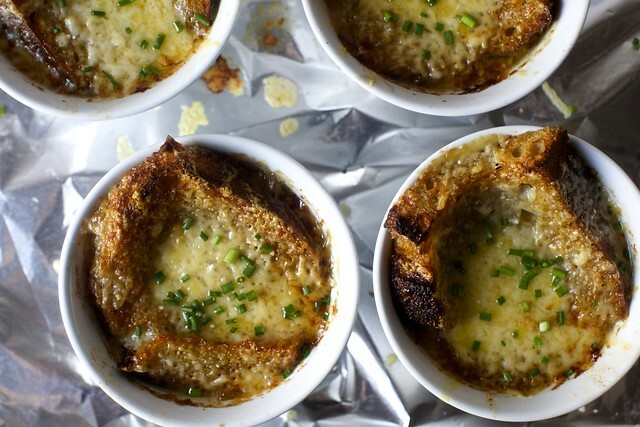 French Onion Soup is a snow-day tradition at our house, but we love it any time. I often use the “Better than Bullion’ beef base, which we call beef goo in a jar, or some of that added to homemade chicken stock. A restaurant I used to work at had FOS on the menu, which we broiled under the salamander, except when making it for takeout–then we just broiled the toast part, and dropped it in to the to-go container on top of the soup. That’s how I do it at home now, even if we’re eating it out of ceramic bowls, so I don’t have to deal with hot bowls. Toaster oven makes quick work of it. Also lazily we’ll used sliced cheese, plus shredded parm, to get a generous layer without too much mess. We use the “1/3 less salt” version of better than bullion. Made this tonight. Delicious is the word – lovely savory hit after a day at work! Thank you for this! I made the soup a week ago – used beef broth, no herbs, and white wine for deglazing. My onions took 90 minutes to cook down. The good: It was absolutely delicious. On par with anything you’d get in a restaurant. And, as Deb said, after slicing the onions, the rest of the time is mostly hands-off. The not-so-good: My house stank of onions for DAYS afterwards. We left the windows open as much as we could (it’s still chilly in Wisconsin), but the smell stuck around for a full 4 days. I had to launder our coats and some clothes that were on the main floor (where the kitchen is). Quite a bit of time will need to pass before I attempt this recipe again!